Notes: Standing stone - prob. prehistoric. 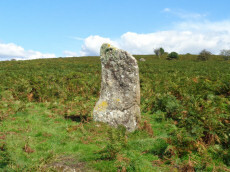 An upright stone, stands at the west edge of Butterdon Down, Moretonhampstead, beside the public footpath, 600 yards from Cranbrook Farm. It is between six and seven feet high and of slightly curved slab shape. Ref: Devon & Cornwall Notes & Queries 31 1970 pp. 225-26. Notes: "The outer rampart cuts or overlies the banks of an earlier field system. Upwards of 30 clearance cairns are visible in the interior; date unknown. The outer defences on the east and west sides are clearly incomplete. On the north side the inner rampart line is marked by 2 very low linear dumps of stone, which appear to have acted as markers for the front and rear of the rampart. No trace of an accompanying ditch. The original bivallate plan of the hillfort is reinforced by the abrupt termination on the west side of both the outer bank and inner bank and ditch in line. Other aspects of the unfinished hillfort are the irregularities in height of inner rampart on the south side. These probably mark divisions between construction gangs." 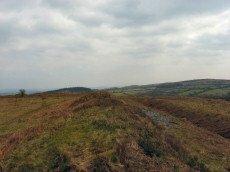 Notes: "Iron Age hillfort, inner works complete, but possibly outer works never finished. Prestonbury Castle is situated three miles north-west of Moretonhampstead high above the north bank of the R Teign. The bank of the inner enclosure measures 418 feet by 410 feet and is 7 1/2 feet high with entrances to the east and west. The middle enclosure bank has a simple entrance on its east side. The outer bank, only partially extant, is strengthened by a rock-cut ditch 20 feet broad. This bank divides into two at the crest of the southern slope. The bank has an inturned entrance facing northeas"